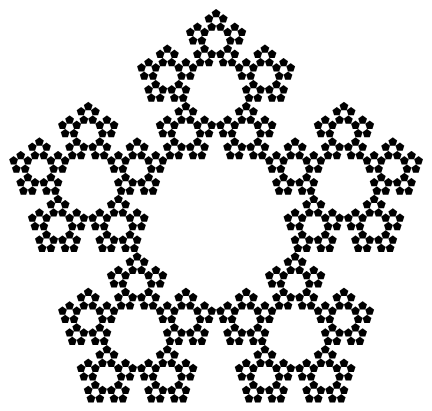 Produce a graphical or ASCII-art representation of a Sierpinski pentagon (aka a Pentaflake) of order 5. Your code should also be able to correctly generate representations of lower orders: 1 to 4. 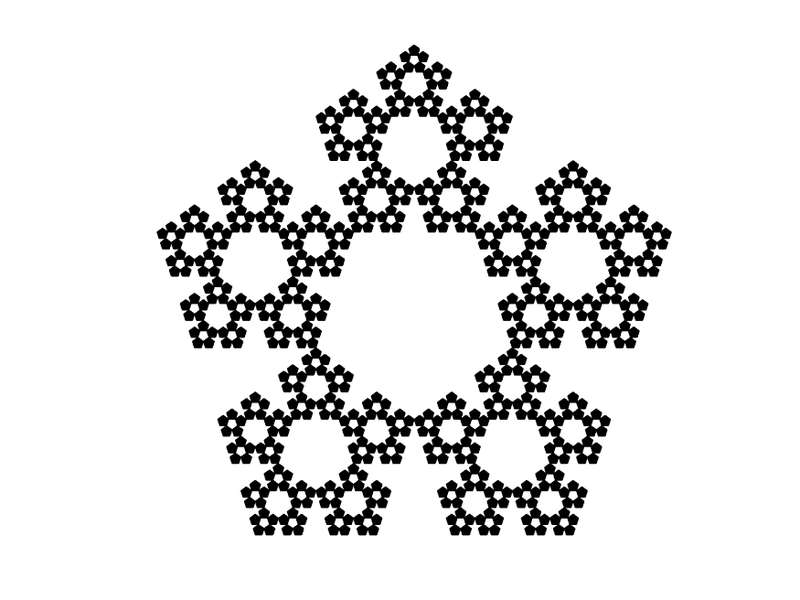 The Sierpinski fractals can be generated via the Chaos Game. This implementation thus generalizes the Chaos game C implementation on Rosettacode. As the number of sides increases, the number of iterations must increase dramatically for a well pronounced fractal ( 30000 for a pentagon). This is in keeping with the requirements that the implementation should work for polygons with sides 1 to 4 as well. Requires the WinBGIm library. This solution combines the turtle graphics concept used in Python, with the SVG output format of the Perl 6 solution. This runs very quickly compared to the Python version. This follows the approach of the Java entry but uses a fixed palette of 5 colors which are selected in order rather than randomly. 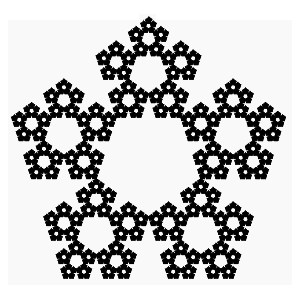 As output is to an external .png file, only a pentaflake of order 5 is drawn though pentaflakes of lower orders can still be drawn by setting the 'order' variable to the appropriate figure. Image similar to Java entry but uses a fixed palette of colors. Function copy for an angle returns transformation, which shifts and rotates given picture, therefore foldMap copy for a list of angles returns a transformation, which shifts and rotates initial image five times. After that the resulting image is scaled to fit the inital size, so that it is ready for next iteration. I didn't try to, but got the first of 2 possible versions according to WP N-flake article. Mine has central pentagon. All others here got second version. This one looks a little bit differently from the 1st version on WP. Almost like 2nd version, but with central pentagon. Not a Durer's pentagon either. Clicking Pentaflake you can see orders 1-6 of it in different colors. Draws the result on a canvas. Runs pretty slowly. See online implementation. See completed output. ;; with a base angle of 72 degrees. ;; length of the scaled side plus the length of the gap. ;; so simply move from one to the other by changing direction. Generates a SVG image to STDOUT. Redirect to a file to capture and display it. <svg height="%d" width="%d" style="fill:blue" transform="translate(%d,%d) rotate(-18)"
See this image. Displays fine in FireFox, in Chrome, it doesn't appear to be transformed so you only see part of the image. This page was last modified on 28 February 2019, at 00:40.